The experience we have in our workplaces is a key component of our wellness and satisfaction. The objects and furnishings we use every day—chairs, tables, lights, and other furnishings—influence our ability to perform on the job. At this year’s 50th NeoCon and 30th ICFF, PLASTARC saw human-centered design take center stage with a focus on health and wellbeing. Some of the products emerged from trends that have been percolating for a while. We also saw exciting precursors of what we think will become major developments in the near future. Open plan offices can make it difficult for some people to work comfortably and effectively, and may not be optimal for the full variety of tasks being performed. Wherever possible, it’s best to empower people to choose the space that is right for the task at hand. While it may be impractical to make major changes to a building, there are non-architectural solutions that can return control of a space to the user. Last year, PLASTARC presented a whitepaper we co-authored with West Elm. In it, we explored one of the inherent tensions of the open office: people want to work independently while still being surrounded by others. They want their space to accommodate individual concentration while still encouraging collaboration when desired. This year, we saw several examples of furniture that can enable that. Re-configurable semi-enclosed spaces and drop-in phone booths give denizens of the open office the ability to choose privacy. Textured, sound-absorbing wall coverings can reduce workplace distractions. These products can also be attractive. After all, practicality and function don’t have to come at the expense of fun, inspiring design. Encouraging people to move around throughout their day, including regularly changing their posture, can have positive effects on health and wellbeing. At ICFF, A.J. Paron-Wildes reinforced the importance of movement during her talk “Working Well”. She spoke about cutting-edge workplace policies and design elements that get people up out of their seats. In an inspiring example, she shared how a hospital mapped out a one-mile route for people to hold “walking meetings”, equipped with touch-down tables placed strategically throughout the route for people to set up. At NeoCon, we saw many creative efforts to accommodate more active styles of working through furnishings. Sit-to-stand desks can facilitate movement and transitions between different work modes. Stools can engage your core while you are having that Monday team meeting. One of the insights generated by our work with West Elm is that our best ideas can take shape while we’re moving or in unique settings—in the shower, sitting on a train, or watching passersby from a park bench. Furniture that enables seamless transitions can help spark new ideas. Employees are sometimes reluctant to spend time socializing. This isn’t surprising, since socializing wasn’t traditionally thought of as work. Recently, companies have realized that cross-collaboration plays a big role in the innovation process, and they are creating spaces that encourage it. Whether it’s your corner cafe, go-to juicery or the taco truck around the corner, ‘third spaces’ help foster a sense of community. Informal cafes and work lounges were big at NeoCon this year, with offerings from Steelcase WorkLife Cafe, Haworth Pop-up Cafe, and Scandinavian Design. These spaces were often the heart of the showroom displays. More workplaces are embracing the idea that social time is work time. We’ve found that community is the foundation of successful workplaces. A unifying multi-purpose piece of furniture can help create that. One of the themes of our work with West Elm was the incorporation of resimercial design, which brings the comfort and utility of home design to the office environment. In addition to being functional and flexible, a kitchen table brings people together, creating opportunities for shared experience and bolstering emotional wellbeing. As studies show, when people share a table (especially for meals), a sense of community follows. 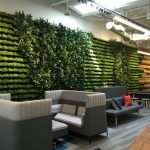 Part of creating healthier, happier, and higher performing spaces is reestablishing our connection to nature in our physical environment. Natural views and access to the outdoors can help with this. Biophillic design takes it a step further, integrating natural forms and colors into the spaces we use. At both NeoCon and ICFF this trend was apparent in everything from potted plants to mobile moss. Designers at ICFF brought typical workplace elements such as walls and tables to life with designs incorporating living greenery. We at PLASTARC are advocates for workplaces that consider the holistic needs of humans, including multi-sensory design, so we love it! The choice of materials offers another opportunity. The touch-points on furniture are part of the workplace experience. Whether they are warm, soft fabric or cold, smooth metal impacts our perceptions of a space. One of the best things about going to an event like NeoCon is seeing the first sign of trends that are just around the corner. Here are some developments we saw early signs of, and which we expect to grow in the next few years. A study conducted by World Health Organization concluded that one in three Americans is suffering from a chronic disease or a condition related to lifestyle, habit, or circumstance. Sophisticated data-gathering and analysis technology is now popping up in furnishings and other workplace amenities. This may help manufacturers understand the range of use cases for a piece and determine whether the design supports them. This tech can also help people to learn about unhealthy behaviors and devise strategies to change their habits. In the near future, major furniture manufacturers will be able to tap into customer digital data trails and make compelling cases for how their products can become life-saving tools. Furniture continues getting smarter. In an age when designed obsolescence sometimes trumps longevity, it was refreshing to see some displays of smart and connected office furniture systems that are designed to be upgradeable. An increased emphasis on the Embedded systems that collect utilization data have been around for a few years now, pioneered by companies like WeWork. Major manufactures like Steelcase and Herman Miller are figuring out how to leverage that data to deliver additional value. Furniture makers may soon offer “spatial insights” as a core service. Workplace design is inherently complex, balancing the needs of people, spaces, organizational culture, and management. As our workplaces become more connected, our use of data to improve these spaces will become more sophisticated. New furniture, fixtures, and amenities can be selected in response to our our needs and habits. 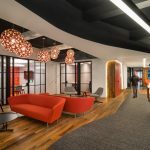 As customers become increasingly sophisticated in how they buy and use furniture to solve workplace challenges, furniture brands are likely to place more emphasis on customer relationships and thought leadership in workplace design. This will be reflected in the way furniture is sold. For inspiration, we can look to companies like Apple, who sell six to ten times more per square foot than of other successful retailers. The success of Apple’s stores comes not only from great products, but also from a retail experience that incorporates a service component. Coming from the other direction, WeWork has just announced that they’ll be adding retail to their service-oriented co-working business. Expect to see similar shifts in interior design showrooms as they focus on using their products to solve specific workplace problems.